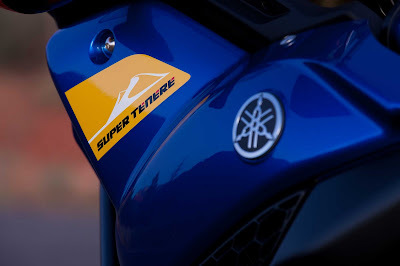 As many of you know, on September 1st 2010, Yamaha announced the Super Ténéré would come to America. 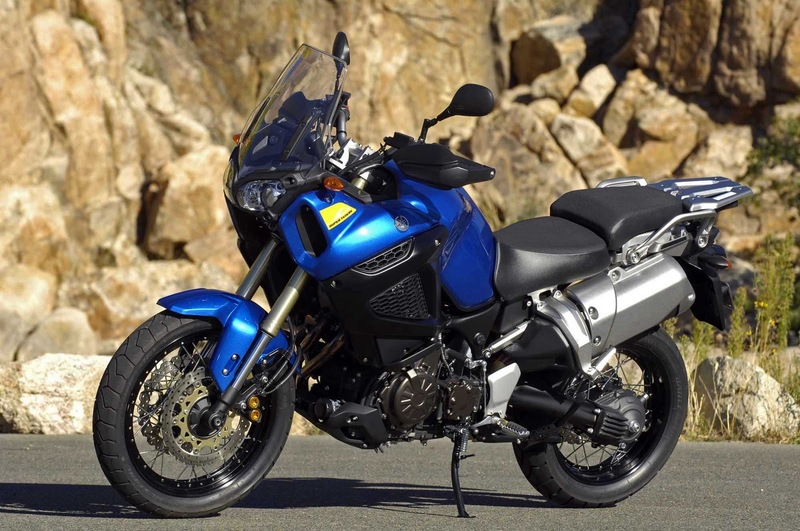 On September 2nd I put a deposit on a "Raven" Super Ténéré. At the time the decision had been easy, I have always liked an all black motorcycle and when I saw the pictures I made up my mind pretty fast. I then asked my wife and she said black, I asked my brother and he said blue, humm, now I had a problem. I stuck with the "Raven" but the "Impact Blue" was becoming more appealing. I asked my daughter and she immediately said blue, actually she said "of course the blue is much nicer". I love my daughter, she is very stylish and always knows what colors go together so I trust her opinion, I tried to defend my choice but she wanted nothing of it, blue was the color for her. Months go by and I stick to my original choice. I continue telling my friends I am getting a "Raven" and I couldn't wait to see it at the NY show. I am sure you already know where this is heading, in January I attend the NY Bike show and for the first time I am able to see it up close. The "Impact Blue" model on display is beautiful. I start having doubts about my choice. I ask my dad and he says the blue is the nicest color. I check back with my daughter and she hasn't changed her mind. Weeks go by and I keep agonizing about my choice. I keep thinking, if I now go back and change color this late, will I still get the bike in May. Keep in mind, blue is the Yamaha color. All the winning Yamahas have carried the Yamaha "Blue". 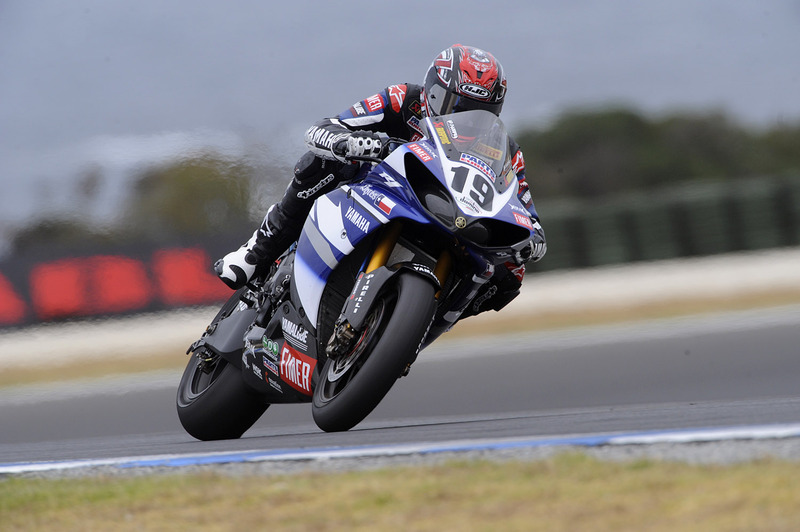 Ben Spies won the 2009 World Super Bike on a blue Yamaha. After many sleepless nights, I am exaggerating a little, I wake up last Saturday and head to the dealer. I had made up my mind, I was changing my order to blue. I walk into the sales guy's office and up on the wall is this poster. Right there and then I knew I had made the right choice, "Impact Blue" is the color for this bike. I ask Mike, the salesman at Xtreme Machines to change the order and he quickly obliges. I tell him I also want the poster and he promises me I will get the poster when I pick up the bike. I come home and tell my daughter I had changed to a blue, "I told you so" she quickly reminds me. Now I can sleep knowing that come May I will be getting this beauty. After all, blue is the Yamaha color. I humbly suggest that the title of this entry should be "Blue is the Best Color, Superior to All Other Inferior Colors". I suppose you'll be celebrating your birthday and Christmas in May this year. Blue..diffinitly blue.....you daught had great tase.....just like here Dad when it comes to bikes! You wont sleep much during April!! Had my ninja been blue the year I purchased, I would have had a tough decision. Good choice. Now, go get some sleep! Kari: I love the blue (Yamaha) but if I was getting a Kawasaki it would be your bike's green, that's Kawasaki. When I stopped by the dealer I sat on a green ZX-10R and immediately fell in love :-) too sporty though for my long rides. I find it exceeding difficult to review your posts, as I find that every blog entry is devoted to the Super Tenere. I'm trying to clear my mind of this bike and yet it continues to haunt my inner thoughts. Blue, black, blue, black, blue. I had a brilliant idea to name my V-strom "Tenere" . That way I could say that I was riding my Tenere even though I was on my Suzuki. Brilliant idea don't you think. I don't think I could get away with BLUE, as then Mrs Skoot would realize that I traded for another bike. I have to stick with black, keep it in the shadows, and keep my mouth shut. Last weekend I rode right past the Yamaha dealer for fear I would bump into the Tenere. I had will power but maybe next time I will stop to admire the poster. 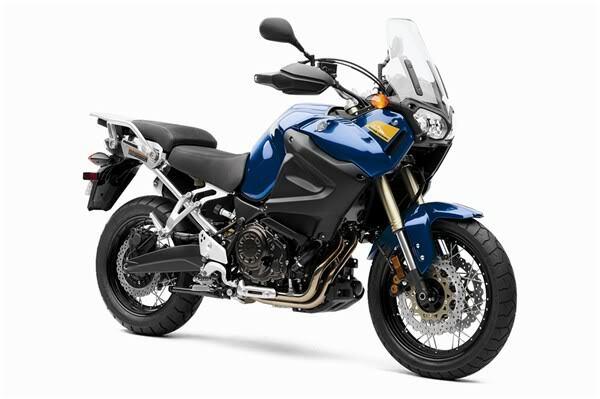 I agree, the blue has lots of black and my panniers are going to be black too, not the silver Yamaha ones. It is not that you have many options, besides black or blue. I would rather prefer something brighter like yellow or orange (but maybe I am biased a bit, riding a bright colored bike myself). It is a lovely blue though, and I am sure you have made the right decision. Ok! My Katana was blue and all three of my WRX's were blue(including the one I still have AND we even have a blue New Holland Tractor, so I'm realy good with that blue George! However, I ended up with the all flat black IRON and I love it....so....Black or Blue!! I like the one you decided on! My WRX doesn't have the gold wheels George but it has the red brakes! Looks great..as soon as I give it a wash! I hate winter! Yamaha was using that yellow when I used to go watch Kenny Roberts racing. That was back in the 70's and 80's. Jeez, that was a long time ago. 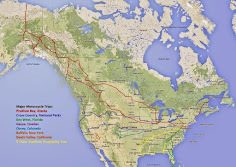 I used to watch a series called the Transatlantic Challenge and he was known as "King Kenny". I would have kept the black. Don't you want to stand out and be different from the others? All black bike, black outfit, black helmet, screams enigma. ps I like the blue too. just busting your chops. 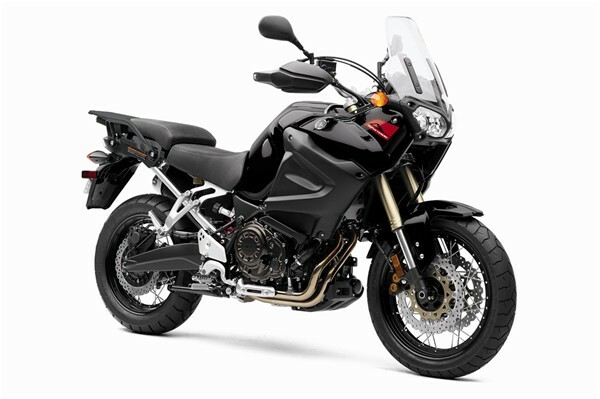 I am wondering if you can share with me what you currently ride and if you had considered a 1200GS before the Tenere? I am torn. I ride a Honda VTX1300R and a YZF250F. I want the best of both worlds. I have a friend who rides the GS and of course swears by it. I currently have a 2005 Kawasaki Concours and for a while also had a Kawasaki Mean Streak. 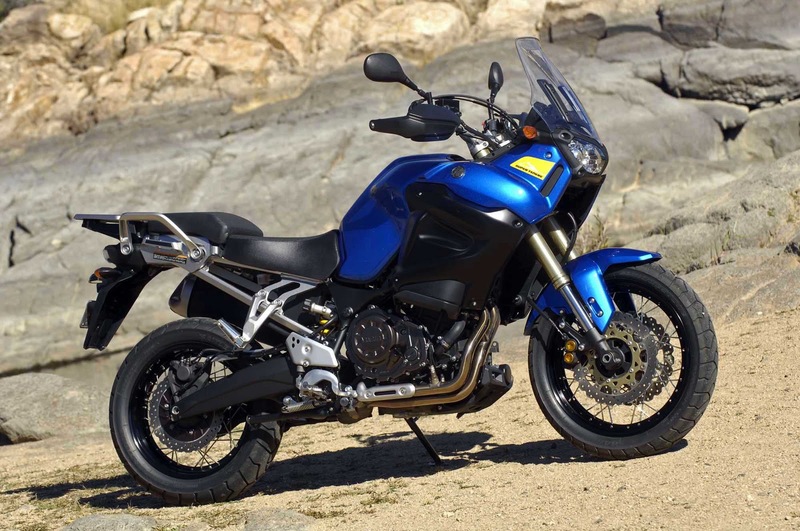 My brother has a GS1200 Adventure, you will see pictures of both our bikes on our cross country report. The GS is to tall for me. I was considering the F800GS or the new Triumph 800XC but when Yamaha announced the Tenere my decision was easy. My only concern was height but I sat on the Tenere at the NY Bike show and it fits me perfectly. BMW is also very expensive in repairs and my brother has had problems with his. Thanks for the feedback. I saw your pic at the bike show. 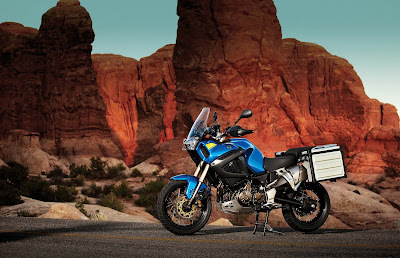 I think I had the same gut feeling you did when I first saw the Tenere and I think I will see one in my garage this year. Cheers from the cold cold North. I'm "goldie05" on ADV rider site.